So you now have read Part I and both know what vinegar is made of as well as what it can be made from. “Doing is knowing” so the next step is to make vinegar on your own! In this part II, we will discuss the steps you will need to set up and prepare your vinegar fermentation. These will include: choosing the type of vinegar you want to make, cleaning procedures, how to inoculate your vinegar, and which type of storage vessels to use. What should you make vinegar from? The answer is anything you want! 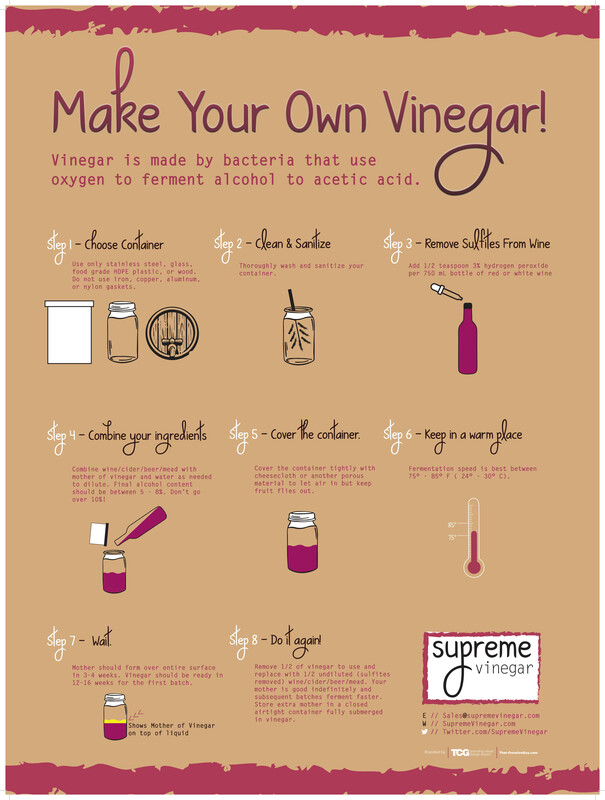 Vinegar can be made from any type of alcoholic beverage. However, this doesn’t limit you to beverages which are regularly alcoholic, but rather you can also use any sorts of juices that you can add yeast to in order to create an alcoholic beverage. The instructions here are general but I will address special issues with wine, beer, etc. as well as your own concoctions such as hard cider or mead. Before you start we need to discuss some cleanliness issues as cleanliness often makes the difference between a successful or failed fermentation. In addition, we need to discuss the appropriate fermentation vessel materials since vinegar has special requirements that are more stringent than even alcoholic liquids. As Part I stated, vinegar is an acid and it will attack and corrode many materials. In short, there are certain materials which you can use and others which are completely prohibited due to the danger of vinegar attack. In addition, if you have a larger setup, any fasteners (such as screws and bolts), valves/spigots, as well as washers, etc. should meet these same specifications to prevent corrosion and contamination by metal salts created by vinegar corrosion. Stainless steel (typically 304 or 316 grade) – do not use the zinc plated or galvanized steel found in many hardware stores. These are easily attacked by vinegar. Plastic – The best option is always food grade high density polyethylene (HDPE). The plastic type initials are usually shown on the bottom of the plastic vessel inside the recycle arrows. Make sure the HDPE is FDA compliant food grade since there are non-food grade HDPE buckets (e.g. for paint). If there is any question, you can order them directly from a company like Uline or buy them at your local homebrewing store. Wood – wooden barrels are classic for vinegar making. The hoop material on the outside should not matter. Silicone (gaskets,o-rings, etc.) – the best material for food grade applications are food grade silicone type o-rings and gaskets. Iron, bronze, brass, aluminum – these metals are easily attacked and corroded by vinegar. The danger is not leaks but rather metal salts created in the reaction with the vinegar that are both foul tasting and sometimes toxic. None of these should be in contact with the vinegar at any time. Many plastics – While vinegar in store bottles can be in PP or PET type plastic containers, for most plastic vessels you buy, it is best to stay with food grade HDPE to be safe. Vinegar can corrode some plastics. Polycarbonate should not be used as it is attacked by vinegar and also is known for its bisphenol A (BPA) content. Vinyl and Nylon – this mainly applies to o-rings, gaskets, or pumps. Vinegar corrodes both of these over time and they should not be used. If you are handling vinegar with gloves, use latex or nitrile. As a final note, make sure the opening of your vessel is as wide as possible so it is easily cleaned and allows a large surface area for the mother to form. I must emphasize the importance of cleanliness, which is important at all steps of making vinegar, especially if you are starting with a sugar solution to go to alcohol and then vinegar. With the alcohol fermentation, it can be easy for spoilage microbes to infiltrate and ruin your batch. There are two parts to cleaning: cleaning and sanitizing. Cleaning is the act of washing the vessel to remove any visible dirt and material, similar to washing dishes. Sanitizing is the act of using chemicals to kill any microbes that may spoil your fermentation. First, you must clean the vessel. For simple cleaning of materials you can use dishwashing soap, though preferably without perfumes to affect the taste. Homebrew stores have other specialty chemicals like percarbonates, often sold in powdery form to add to water. Sanitizing is the killing of microbes and must be done after cleaning. Chlorine bleach, diluted in a ratio of one tablespoon per gallon of water, does a great job if soaked for at least two minutes, though fifteen is preferable. Amongst homebrewers, a common standby is Iodophor, which is mixed in a ratio of one tablespoon per five gallons of water. This can be easily used on all materials for quick and comprehensive sanitation. Iodophor contains iodine, however, so it is best not to use it if you have iodine allergies. A good alternative chemical in this case is Star San, also available at most homebrew stores. I will not cover this in detail here since there are so many resources around the Internet which give the topic of homebrewing or winemaking its just depth. For fruit wines, the forum at winepress.us has several topics that can be excellent guides to making wines from all types of fruits. In short, you will need to add yeast to the juice in order to make it into vinegar. For any quantity up to several gallons, one packet of yeast from a homebrew or winemaking store should suffice. Do not use baking yeast found in grocer stores as that is specially selected for baking and poor in providing fermentation for alcoholic beverages. There are several key things you need to determine before trying to make juice into vinegar though. First, is the rough sugar content. Sugar content is measured either by Brix (that measures sugar in grams per 100 mL of water) or specific gravity (that measures the juice’s density relative to pure water). Determining sugar content is important since sugar content directly determines the alcohol content from yeast and finally alcohol content determines vinegar acidity. Too low of a sugar content will generate a weak vinegar that may both taste bad and not prevent spoilage bacteria. For store bought juices, your job can be pretty easy. Look at the Nutrition Facts label and find the grams of sugar. Make sure you only use the grams of sugar and not the total carbohydrate grams. 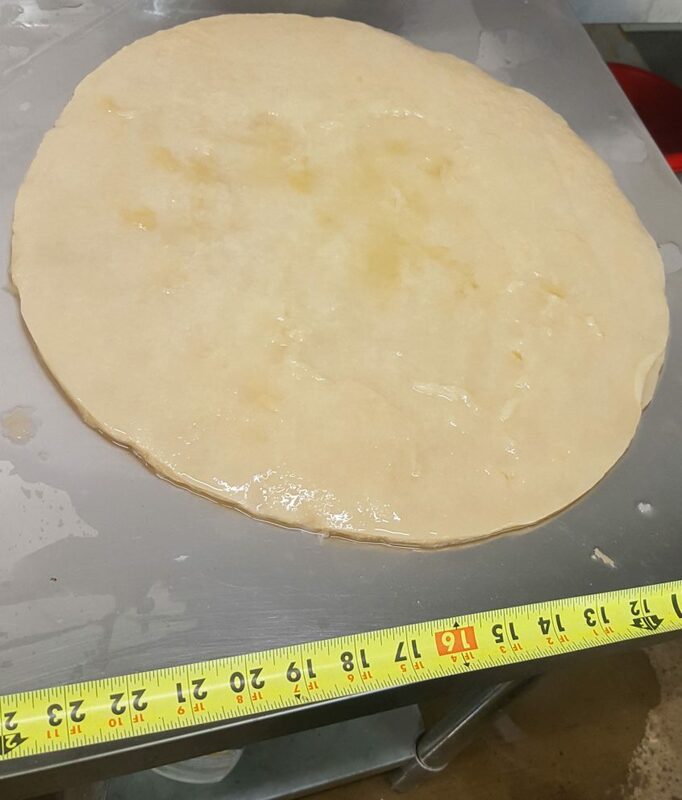 Next, divide this by the stated serving size in mL and multiply by 100. So for example, a typical orange juice has 23 g of sugar for a 240 mL serving size. This means the Brix is 23 / 240 x 100 = 9.6 Brix. 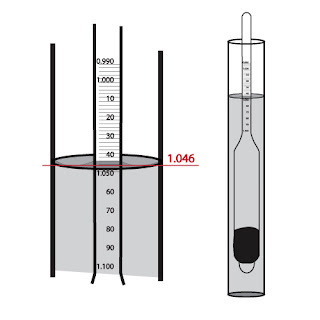 You drop the hydrometer in a graduated cylinder filled with the juice and it rises and floats relative to the sugar content. The reading on the hydrometer at the surface of the juice will tell you your Brix/specific gravity. From this, you can use a table like the one here to determine the potential alcohol your yeast can produce. For vinegar production, you want a minimum of 4.5% potential alcohol and a maximum of about 8% so you need a Brix/specific gravity roughly between 9/1.035 to 14/1.055. Note this maximum alcohol is much lower than your typical wine. Make sure that the volume of water and juice are in the same units when you calculate. Now that you have adjusted the sugar to the correct level, you are ready to add brewing yeast to the batch to produce alcohol. If you are starting with wine, cider, mead, beer, etc. your job is much easier. In the case of beer, you don’t need to do anything. Just remember that beer is typically lower alcohol so you want to use a beer of at least 4.5% ABV to get an appropriately acidic vinegar. For wine, with ABV between 12-14%, you will have to first remove sulfites and then dilute it down. Sulfites are added to wine specifically to prevent the reactions that allow the formation of vinegar. They are easy to remove though. Stirring for about thirty minutes is the oldest way to help the sulfites escape as a gas. A quicker and safe way is to add a small amount of standard 3% hydrogen peroxide. For one 750mL bottle of wine, ½ teaspoon is enough. Add the hydrogen peroxide, stir for a few seconds and the sulfites are removed. So to get 7% ABV from 14% ABV wine, the combined water+mother should be equal to the wine volume. To go from 12% to 5%, the volume should be 1.4 times the volume of wine. Please note the vinegar conversion is not 100% efficient so usually the final acidity is around 90% of the starting ABV. So your target ABV should be your target vinegar acidity divided by 0.9. Now the alcoholic mash is prepared, you are ready to start your vinegar. In order to start your vinegar you must add the mother of vinegar. This is available in several forms. First, there are commercial mothers of vinegar such as those sold by us through Amazon or homebrew outlets. These are grown to produce especially vital cultures and are filtered to remove harmful spores that may cause mold etc. There are also the raw vinegars you can find at the grocery store such as the common raw apple cider vinegars. The advantage of mothers designed for vinegar making is the amount of solid mother is larger and the vinegar is fermented in a specialized industrial process that maximizes the amount of bacteria for fermentation. Store bought raw vinegars can be fine though (honestly) they can be less consistent partially due to the manufacturing process (submerged process) that is biased towards cultivating bacteria that need a rapid and ready supply of injected oxygen. Many of these can survive but it is not consistent since the health benefits of the vinegar do not vary with the vitality of the mother bacteria. They may also require more time and bias your vinegar towards an apple cider flavor. They can also take a bit longer to get started in fermentation and building a mother. This was a fact I have found when the vinegar bacteria from different sources and manufacturing processes are cultured on petri dishes media for RNA analysis (another topic for another time). 1. For wine or alcohols with ABV between 6-15%, the dilution should be done as per the previous section adding water and mother in equal proportions to set the volume needed to dilute the wine to the desired ABV. 2. For alcohols between 4.5-8%, if you want an acidity near to the ABV, you do not have to add water but just add mother in a proportion 1:1 between the mother and alcohol. Add the mixture to your fermentation vessel and then cover it with something such as cheesecloth or a thin towel. You need the cover to be air permeable as the vinegar fermentation requires oxygen, however, you want it to be snug, tied with a string, so no pests such as fruit flies can get in and begin to breed. Then sit it in a warm place and wait for your mother to form. The initial lag can be as quick as 2 weeks or as long as six weeks depending on factors such as the bacteria type, temperature, and the amount of nutrients in your alcoholic mash. Update February 2018: Want to make vinegar even faster? Please see our new post on the semi-quick (Boerhaave) process. I’m making three vinegars (for the first time): red wine, white wine, and cider. I followed the instructions on your 8 oz bottles of mother and just put them into cheesecloth-covered 2-gal glass crocks. If I want to brew larger quantities after these vinegars ar ready, what do you recommend? I want to have enough for personal use and for gifts. Thanks in advance for your reply. Hi! Thanks for your comment. The procedure after your first batch is to drain 50% of the finished vinegar and replace with (undiluted) wine (with sulfites removed) or cider. There is no need to mix water in the second batch. You can also take out some of the mother after removing the 50% vinegar to start a new jar. Hi! Excellent site! I’m preparing my first vinegars, but I think there’s another way to reduce the amount of alcohol in wine, by just measure the amount of liquid and let evaporate until the desired quantity; as alcohol will be the first element to evaporate, you’ll have it… am I right? Alcohol does have a lower boiling point than water but it could be sometime for a significant amount of alcohol to evaporate on its own. In addition, by letting the alcohol evaporate out, you are reducing the quantity of vinegar you can make since the alcohol content directly leads to your yield in vinegar acidity. Dilution is the best route unless you believe there will be a huge loss in flavor. We were recently in the south of France and there was a wine crock in the kitchen. When we asked, they said to go ahead and use the wine for dressing etc and to slowly add any left over wine into the crock, trying not to disturb the mother. I recently did this at home and had the most amazing red wine vinegar until the spigot cracked and began leaking. I am starting a new batch, with your red wine mother as I didn’t realize that I could have keep the old mother that had developed. My question is that everything that I have read says that you should remove the vinegar when it is ready, however, I didn’t do that with my first batch nor in France. Is it possible to just leave it in the crock and continue to add wine as it’s used? Yes, that is possible. You can continue to add wine and it will just create more vinegar just fine. I just typically recommend people remove some vinegar so they have some to use over the period of time the next batch is fermenting but it is all personal preference. Hi reginald, your page is very helpful, learning a lot. Something I dont get clear is that when I have a 5/6% ABV how much mother I should mix to not diluete so much. You said 1:1 to alcohol, so 6% of vinegar with mother is what I should use? Sorry if it is a stupid question. Thanks so much! Regards. Hi, thanks for your question. When you have low alcohol (like beer) you should dilute only with mother, you typically don’t have to add water. If you have a 4% mother and you cut it half and half with 5% beer, your ending vinegar acidity should be between 4-4.5%. Only up to 1/2 of the volume should be mother and the mother can be as little as 1/4 of the volume depending on what final acidity you want. If the packet recommends only 50 liters at a time, you should use it to prepare 50 liters and then once this 50 liters is done, use that to convert the other 450 liters. Trying to use it all on 400 liters will either not work or result in mold due to the low acidity. Really enjoying reading the posts as I am starting to make cider vinegar and I am hoping you can help me figure out how to calculate when the vinegar has finished fermenting with a hydrometer. The cider I have made is 6.5% ABV and the hydrometer reading at 20 deg is 1.010 so still a bit of sugar remaining but finished fermenting and crystal clear. I note that vinegar is denser than water about .05% on the hydrometer so will the hydrometer reading increase as the vinegar ferments or am I barking up the wrong tree. Hi, Len welcome to vinegar. When you are making cider vinegar, a hydrometer is unfortunately of little use in determining how far the vinegar has fermented even though acetic acid is slightly more dense than water. It isn’t used in the industry or even amongst hobbyists as a reliable practice. Your 6.5% ABV cider can produce at best, 6.5% vinegar though it will likely be between 5.5-6.5%. Though 6.5% vinegar has 6.5 g acetic acid per 100 mL of water, the overall mass change in vinegar from fermentation from hard cider is complicated by the fact that oxygen is combined with alcohol to make acetic acid so the density change is slightly higher from hard cider but still relatively hard to measure. A pH meter should show 3.5 or below and if you know how to titrate, that can help measure the acidity. Thank you for your reply. I do not know how to titrate. Is this the only method? I have a PH meter that I use for cider so if I measure the PH before the vinegar ferment then will this decrease as the vinegar ferments? pH will decrease as the vinegar acidity increases. At pH of 3.5 or below apple cider vinegar is basically done. If you want to titrate, you can buy a wine acidity testing kit from a homebrew store. You can also buy a setup with a burette, chemicals, etc. but that is probably more money and headache than you want. Finally you can send a sample to a local wine or cider lab and they will measure acidity for you. If it is like the US it should cost 10-15 pounds or so. Hi Reginald, unfortunately my cider has a low PH as I use sharp cider apples to avoid infection during fermentation so PH won’t help. By the responses I am having I am coming to the conclusion that the only way to accurately measure acidity of vinegar is through titration. If that is correct can you recommend any material or an idiots guide book on titration. Many thanks for you help to date. I have a question not seen asked anywhere else, perhaps it’s not relevant. Which mothers for which wines? Can I use any kind of mother to convert a home-brewed plum wine into vinegar? Any kind of mother can be used to make any type of vinegar. The main reason for the different mothers is to ensure a smooth taste profile. For example, using malt vinegar mother to make apple cider vinegar will leave a residual ale/beer taste. Thanks for your posting of all of this informative material! I just started my second batch of wine vinegar. I have a 5L barrel and mixed 4 bottles into about 1 L of leftover vinegar from my last batch (and part of a mother I had in the fridge). I watered this down to about 10% abv. It have been going for 6 weeks now. No mother has formed, though it smells and tastes like vinegar (I’m not quite sure if it is complete, though). I started smelling some acetone in the vinegar today, so I drained the barrel and aerated. Though, I’m wondering what I’m doing wrong about the acetone smell. Do you know what might have happened? Do you know what I should do? Do you know a sure-fire way of knowing when the fermentation is done? I’m a brewer, so I’m more used to definitive methods of the hydrometer. Hi Stephen, thanks for your comment. First, the sure fire way to tell vinegar is done is by titration with dilute (0.5 – 1.0 N) sodium hydroxide to measure its acidity. It needs to be at least 4% (4g acetic acid / 100 mL H20). You can do this with a wine acidity kit, send it to us, or send it to a local wine lab. As for the acetone smell, it is acetaldehyde, the intermediate between alcohol and acetic acid from vinegar fermentation. Usually the acetaldehyde doesn’t last long and is converted to acetic acid but sometimes if there is a fermentation issue it can hang around. It doesn’t mean the fermentation is ruined though. It can be caused for a variety of reasons but first I would dilute your mixture down to 8% or so. 10% is the upper limit and can cause issues in fermentation. It may or may not be the cause of acetaldehyde build up but it is possible. I would also add a bit of nutrients such as one packet of brewing yeast that may help as well. Nutrient deficiencies that limit enzyme formation are another way that acetaldehyde can build up. Try these and let me know if they help. Thanks! After adding a bit more water down to 8%, the mother formed almost immediately. It took a while to work through that acetone smell, but not it is smelling great! Still quite sharp. I would rather age it than dilute it more. Would you recommend adding nutrient at the beginning of every new batch? If I transfer from my barrel to a gallon bottle. Would it age and mellow well? On that note, could I just bottle it in my small bottles to let it mellow? Awesome, congrats! I agree, age it to improve the aroma and taste, do not dilute it. If you are using wine, nutrient isn’t strictly necessary but it can’t hurt. It will add amino acids and other nutrients that improve flavor over time so go for it but don’t feel you need to overdo nutrients. A little goes a long way. It will age well in a bottle. Just put it somewhere that can be closed airtight since while air is needed for fermentation, it is detrimental for aging. You can age vinegar almost indefinitely and it improves greatly with time.